Here's the live updates of UFC 205: Alvarez vs McGregor fight. FIGHT UPDATE: Conor McGregor defeated Eddie Alvarez via 2nd round TKO! 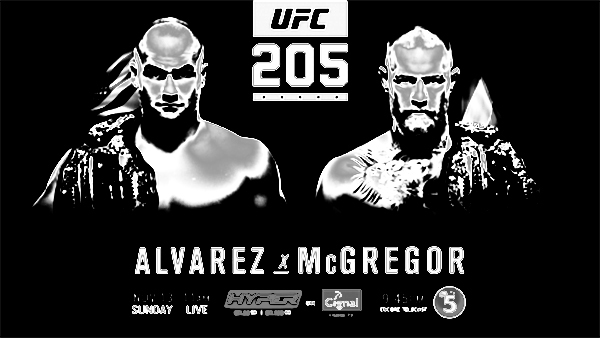 UFC 205: Alvarez vs. McGregor is an ongoing mixed martial arts event promoted by the Ultimate Fighting Championship being held on November 12, 2016 at Madison Square Garden in New York City, New York. Watch the fight replay soon here. In the main event, UFC lightweight champion Eddie Alvarez puts his belt on the line against UFC featherweight champion Conor McGregor. McGregor is trying to become the first UFC fighter to hold two UFC belts simultaneously. UFC welterweight champion Tyron Woodley will defend his title for the first time against Stephen Thompson in the co-main event. UFC strawweight champion Joanna Jedrzejczyk squares off against Karolina Kowalkiewicz also on the main card. According to Conor McGregor, he will be "immortalised" if he secures a second title belt at UFC 205 in New York tonight. Irishman McGregor will headline at New York's Madison Square Garden as he challenges Eddie Alvarez for the UFC lightweight title, attempting to make history by becoming the first man to hold two UFC belts simultaneously. McGregor has been the champion in the UFC's featherweight division since last December when he knocked out Jose Aldo. So, what's you thought about the fight? Would it be a success for Mcgregor? Or he's downfall?